When I saw our baby for the first time on the ultrasound screen my first thought was: a heartbeat! My second thought was: it looks like a little frog! Our belly baby has a nickname: Baby Froggie. The actual ultrasound pictures don’t look like much. The ring is the yolk sac and the baby is below, head on the left about equal size to the body on the right side. The ultrasound measured 7w1d, which means yesterday I was 8 weeks, due around April 21, 2015. 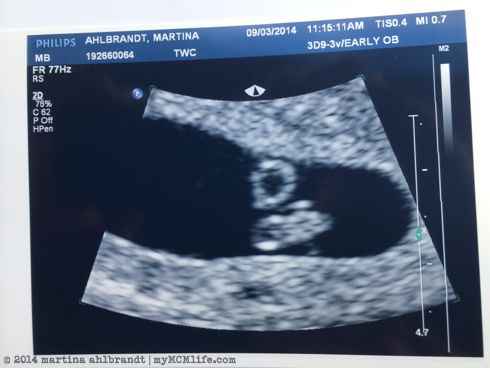 I prefaced showing Ali the photos of her new baby brother or sister by explaining that the baby is still very small, the size of a blueberry, and the photo is hard to make out. She excitedly looked as I pointed out what’s what in the photo and said, “Awe! It’s so cute!” What a sweet big sister. She’s currently thinking the baby will be a little sister. 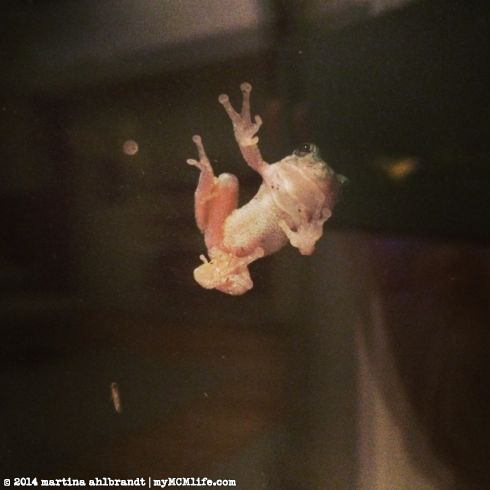 Later that night I had to laugh when I saw this tiny little frog, not much bigger than our baby right now, clinging to our back door. God has a great sense of humor! We’ve had frogs visit before but never one this tiny. This entry was posted on Wednesday, September 10th, 2014 at 8:00 am and is filed under Family, Family: Froggie/Isaiah. You can follow any responses to this entry through the RSS 2.0 feed. You can skip to the end and leave a response. Pinging is currently not allowed. Congratulations! What wonderful news. 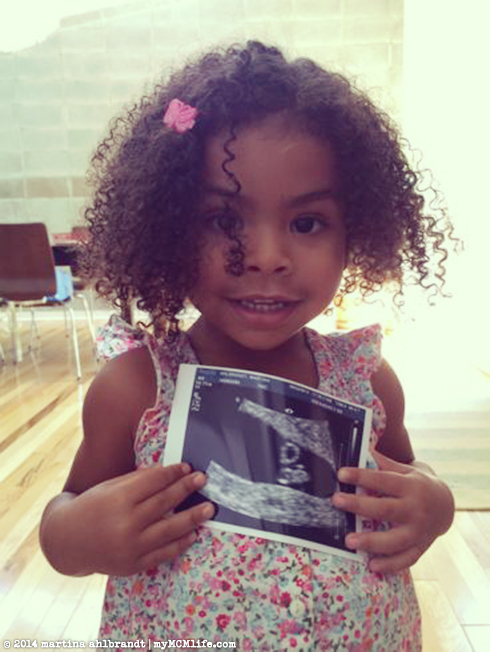 Many blessings on “little froggie” and your family as you prepare for the baby’s arrival. I am so happy for you i welled up and cried. I have read your blog as we have gone through adoption losses this april 2014 we lost two.kids we thought would be ours it was more than devestating after bonding with them.so.much while we had them in custody. I appreciate your strength in christ and example through it all. Congratulations!! !